Pre- and post-analytical processes are equally important for ensuring quality laboratory services. Studies have shown that laboratory errors occur primarily in the preanalytic phase, thereby influencing patients management outcomes and cost., Insufficient data on laboratory request forms can make interpretative comments difficult and may delay communications with the requesting doctor, more so in patients with life-threatening medical conditions. Laboratory request forms provide information about the laboratory test being requested for by the doctor. This information includes demographic data and other information such as laboratory number, doctor's name and signature, nature of specimen, date and time collected, the location of the patient, clinical diagnosis, the current treatment being given to the patient, date sample is sent, date reported, and many more. Incomplete filling of these forms with the above information may lead to laboratory error. Increased work load on laboratory personnel could be worsened by incomplete laboratory request forms provided by the doctors leading to a rise in the rate of preanalytical errors. A collection of laboratory results and their delivery to the requesting doctor are also an essential phase of the clinical laboratory testing process. In post-analytical phase, delivery of critical laboratory values to the requesting Physician could be challenging when either the details of the patient from whom the analysis was conducted or the contact details of the physician making the request is not provided. Most laboratory errors have been reported to occur at the preanalytical phase. This refers to procedures performed neither in the clinical laboratory nor under the control of laboratory personnel., Examples include completion of a laboratory request form, specimen identification, sample handling, and transportation to the laboratory. This contributes about 68% of all laboratory errors. These errors including insufficient information or data on laboratory request forms could make interpretative comments difficult and may delay communication with the requesting physicians, more so in patients with life threatening medical conditions. Laboratory professionals need to have an idea of when samples were taken for analysis before receipt in the laboratory as falsely low result for some biochemical analytes could be due to prolonged time between collection, separation, and analysis. Furthermore, making a decision on the right choice for an appropriate antibiotic during laboratory operation could be highly dependent on the previous drugs on which the patient has been placed on which should be indicated in the request from by the requesting physician. Where these are lacking, critical decision during laboratory process become very challenging, and quality care could be compromised. Quality assurance implies getting the right result, at the right time, on the right specimen, from the right source with results interpreted using correct reference data and at the right and affordable price. It encompasses both internal quality control (QC) and external quality assessment (QA). Quality and accountability are the focus of current concern in laboratory medicine. Laboratory based audits evaluate components of laboratory services; providing feedback to staff and users of the laboratory. The audit has been defined as a quality improvement process that seeks to improve patients' care and outcomes through systematic review of care against explicit criteria and the implementation of change. Audit of entire laboratory process has become a part of continuous quality improvement process and key element of clinical governance. Laboratory professionals have long realized the importance of monitoring all the steps in laboratory testing to detect and correct defects. However, most of their attention has been directed toward detecting and correcting defects in the analytical portion of the testing process, such that analytical mistakes now account for <10% of all analytical mistakes. Evaluation of laboratory request forms is a preanalytical audit process targeted toward detecting and correcting errors which are known to impact negatively on quality laboratory operations and patients' outcome. Laboratory request and test procedures are still largely and manually processed in most laboratories, especially those in the developing world making it prone to avoidable errors in this environment. Premised on this, most clinical laboratories have long focused their attention on QC methods and QA programs in dealing with the analytical aspects of testing with a view to reducing errors. Most health-care centers in the developing countries pay little attention to either the standard of the request form in use or the information supplied in them as required by standards stipulated for best practice. In centers where forms are available, incomplete laboratory request forms are rarely rejected at service points. In many instances, the reception staff, due to the lack of adequate training on laboratory processes and poor understanding of the concepts of good clinical laboratory practice may not know the significance of missing data in request forms. This oversight could increase the occurrence of errors in the laboratory process which have been defined as any defect occurring at any part of the laboratory process. These errors are of utmost importance as laboratory data influences 70% of medical diagnosis and can significantly impact on the cost and outcome of patient treatment. The need to reduce laboratory errors, rejection of laboratory request at the reception and reduce analytical phase turnaround time (TAT) through an improvement in the information supplied in request forms as stipulated by the current regulations governing operation and management of modern clinical laboratory practice with a view to ensuring quality assurance becomes inevitable. This study was therefore aimed to evaluate the prevalence of incomplete filled laboratory request forms submitted to University College Hospital laboratories and to document the important information that is consistently overlooked when filling the laboratory request form. This was a laboratory-based cross-sectional study. The study was conducted at University College Hospital, Ibadan; a tertiary hospital located within Ibadan North local government Area. The hospital is 1500-bed tertiary health center serving a population of about 300,000 in south western Nigeria. It receives samples from within and outside the state. It has several laboratories-chemical pathology, hematology, medical microbiology, histopathology and public, private laboratories which receive more than 50% of the samples. A total of 5000 laboratory request forms, 1000 each from the laboratories mentioned (chemical pathology, histopathology, hematology, medical microbiology and public, private partnership) were retrospectively reviewed. A complete review of all request forms was concluded in 4 months (January–April, 2016). The request should bear the hospital's logo and should be written within University College Hospital complex. All forms not written in the official approved form of University College Hospital, Ibadan. P = 0.48, Ogbaini-Emovon et al. Therefore, the minimum number of forms required was 783. This, however, was increased to 1000 with a view to increasing data precision and reduction of attrition. Standardized checklist as recommended by ISO 15189, a quality requirement for clinical laboratories was used to audit the request forms. Ethical clearance was obtained from the Oyo State Research Ethical Review Committee, a unit of Ministry of Health, Oyo state. Confidentiality of names and laboratory results recorded in all the request forms were ensured and maintained. Data obtained from the study was analyzed using Statistical Package for Social Sciences (SPSS) version 16.0. Data was summarized using frequencies and proportions for qualitative variables. A total of 5000 laboratory request forms were obtained and evaluated from January to April 2016. Equal number of laboratory request forms was obtained from each of the laboratories, and the percentages of different information either inadequately supplied or not indicated in the request forms were examined. Patients' age was inconsistently written in request forms sent to all the laboratories. The contact details of requesting physician, the nature of treatment being given to patient, date, and time sample was collected, date and time it was received in the laboratory and the time results were released from the laboratory to the requesting physician were common omissions in all the request forms sent to various laboratories [Table 1]. Adequate documentation of all activities relating to laboratory operation is an essential requirement for achieving quality data and continuous improvement. Data from this study have shown that patient's age was either abbreviated or not available in all the request forms sent to the laboratory except those sent to Histopathology laboratory. Among the request forms sent to Medical Microbiology laboratory, only a marginal fraction had the age of the patients abbreviated (0.1%) (written as an adult, instead of real age in years) and unwritten (2.5%) (neither documented in years nor adult), respectively. Our finding is consistent with the study of Adegoke et al. who reported the same trend among the request forms which they evaluated. Many biological analytes vary with age. For example, an elevated alkaline phosphatase which is often considered normal in a growing child due to high osteoblastic (bone forming cells) activity, could be a pathological event in an adult. When demographic information such as age is either missing or not adequately supplied in any clinical process, there could be challenges in the clinical interpretation of data. This could limit clinical decision and management of diseases. In the analytical process, laboratory professionals could assume the data to be an analytical error leading to analytical repetition and waste of limited resources. Furthermore, inability to properly document the age of patients in any clinical, laboratory, or research process could limit epidemiological studies and interpretation of data. The policy in Histopathology laboratory mandates that any request form with an inadequate supply of all required information should be sent back to the requesting physician. This could account for the observation from this study. Furthermore, the Department of Medical Microbiology has been engaged in obtaining an international accreditation with one of the international accrediting agencies. This effort, no doubt, could have a direct effect on both laboratory operations and users. Of significant interest in this study was the non- documentation of the contact details of the requesting physician, date and time samples were collected, date and time samples were received in the laboratory, and the time the results leave the laboratory which was observed among all the request forms sent to all the laboratories. This again was consistent with the finding of Ogbaini-Emovon et al., who reviewed a total of laboratory request forms from a tertiary hospital in Benin City and reported that many of the forms reviewed had deficiencies in terms of missing or incorrectly stated information, incomplete or missing information in respect of patient identity and had error in relation to clinical information. Delivering laboratory reports on time is one of the good measures of quality assurance. Laboratory data should be fit for purpose. Adequate monitoring of analytical TAT (time between when sample is received in the laboratory and when the result leaves the laboratory) and pre-analytical TAT (time between when sample is collected from the patient, and when the result gets to the patient) are all integral components of quality laboratory processes and indicators of efficient laboratory process. It also constitutes a significant component in achieving quality care. The data obtained from this study suggest that effective monitoring of either analytical TAT or pre analytical TAT could be difficult. Adequate monitoring of TAT reveals to management where business operations need improvement either through the allocation of more resources, staffing needs, increased budgetary allocations or improving and restructuring the entire system. When TAT cannot be determined, there could be a delay in laboratory operation, laboratory results may not get to patients and clinicians on time, clinical decisions and interventions could be affected resulting in poor prognosis. Again, it could result in allocating resources where it may not be critically required, thus resulting in wastage. Laboratory professionals need to have an idea of when samples were taken for analysis before receipt in the laboratory as falsely low result for some biochemical analytes could be due to prolonged time between collection, transport, separation and analysis. The time at which sample is collected is very critical in the interpretation of laboratory data. Levels of many biological analytes exhibit different concentrations over night and day periods (diurnal variation). A study by Rivera-Coll et al. showed that there was a significant diurnal variation in the plasma concentration of Apo-A1 and Apo-B lipoprotein. Plasma levels of Thyroid stimulating hormone, cortisol, bilirubin, hemoglobin, insulin, iron, potassium, testosterone, and red cell count have been reported to be the highest in the morning hours; but blood levels of eosinophils, creatinine, glucose, triglyceride, and phosphate are normally lowest in the morning hours., If the time when the sample was collected is omitted in the request forms, erroneous interpretations of these analytes could be made. The effect could be wrong clinical decision, wrong administration of treatment and poor clinical outcomes. Data from this study also revealed that in most of the laboratory forms evaluated, contact details of requesting Physicians, and treatment being given to patients were either not provided or limitedly documented. This observation was also consistent with previous studies performed by other researchers at different locations within the country., Laboratory results and its delivery to the requesting Physician are essential processes in clinical laboratory operations. In post-analytical phase, delivery of critical laboratory values to the requesting physician could be challenging when either the details of the patient from whom the analysis was conducted or the contact details of the physician making the request is not provided. In developing countries where laboratory processes are still manually driven due to the perceived high cost and logistics of integrating laboratory information systems and electronic health records into health care operations and management, the need to deliver critical results on time to requesting physicians cannot be under played. This justifies the importance of providing physician's contact details in laboratory request forms. Decision-making on the right choice of an appropriate antibiotic during laboratory operation could be highly dependent on the previous drugs on which the patient has been placed upon which should be indicated in the request form by the requesting physician. Where this is lacking, critical decision during antibiotic testing of isolated organisms could be challenging, quality of care could be compromised and antimicrobial resistant could be precipitated. This study has shown that there was poor compliance among Physicians in documenting the required information when filling medical laboratory request forms for laboratory investigation. 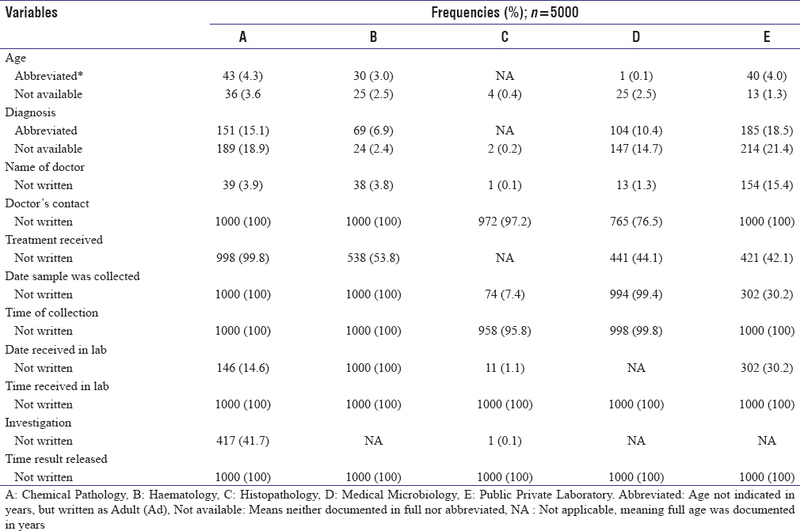 Based on the discussion presented in this study, it is possible that when laboratory request forms are not properly filled, it might limit the interpretation of laboratory data, increase TAT and limit the utilization of laboratory data for effective management of patients. Well-structured laboratory request form and adequate supply of all the necessary information could be very critical in achieving quality data and enhancing smooth laboratory operations. It could reduce the occurrence of rejections at reception and reduce analytical phase turnaround time (TAT). We recommend a change in perception and adequate training of laboratory users which could change the observed trend in this study. For uniformity in request forms across laboratories, there is need to redesign and standardize all request forms using ISO 15189 template. Standardization of laboratory request forms across many health-care facilities in Nigeria could have a direct impact on the quality of laboratory operations with a view to improving health outcomes. Further study should be designed to investigate the impact of interventional approaches on improving laboratory operation and TAT. AAO is grateful to Johnson and Johnson (JnJ), Management Development Institute (MDI), Anderson School of Management, UCLA, African Malaria Research Foundation (AMREF) and Ghana Institute of Management (GIMPA) who provided financial support and platform to attend a conference where the initial data for this study was first discussed. Adegoke O, Idowu A, Jeje O. Incomplete laboratory request forms as a contributory factor to pre analytical errors in a Nigerian teaching hospital. Afr J Biochem Res 2011;5:82-5. Lippi G, Bassi A, Brocco G, Montagnana M, Salvagno GL, Guidi GC. Preanalytic error tracking in a laboratory medicine department: Results of a 1-year experience. Clin Chem 2006;52:1442-3. Laposata M, Dighe A. “Pre-pre” and “post-post” analytical error: High-incidence patient safety hazards involving the clinical laboratory. Clin Chem Lab Med 2007;45:712-9. Onyeaghala AA. Principles of total quality management for biomedical and analytical scientists. Lagos, Nigeria: Change Publishers; 2009. p. 51-88. National Institute for Clinical Excellence. Principles for Best Practice in Clinical Audit. London: National Institute for Clinical Excellence; 2002. Plebani M. Towards quality specifications in extra-analytical phases of laboratory activity. Clin Chem Lab Med 2004;42:576-7. Ogbaini-Emovon E, Ojide CK, Mordi RM, Oko-Oboh GA, Osumah O. Inadequate information in laboratory test requisition in a tertiary hospital in Benin City, Nigeria. Afr J Online 2013;12:13-20. Rivera-Coll A, Fuentes-Arderiu X, Díez-Noguera A. Circadian rhythmic variations in serum concentrations of clinically important lipids. Clin Chem 1994;40:1549-53. Dale JC. Preanalytic variables in laboratory testing. Lab Med 1998;29:540-545. Burtis CA, Ashwood ER. Tietz Fundamentals of Clinical Chemistry. 6th ed. Philadelphia: W.B. Saunders; 2008. p. 53.